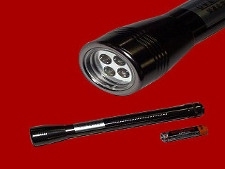 xtremely compact, portable torch type UV light source. Requirement of high brilliance spot illumination for limited portion can be achieved with this. Operates on three 1.5 volt AA batteries and four high intensity UV LEDs.